So, one function of public art is that it stops you and makes you think differently about your life, your day, your surroundings. We would submit that Tom Grotting’s little unfunded local public art project does just that. Grotting says he simply soaks a few pairs of jeans and hangs them for a bit. This makes them both malleable and able to take a stand independently. 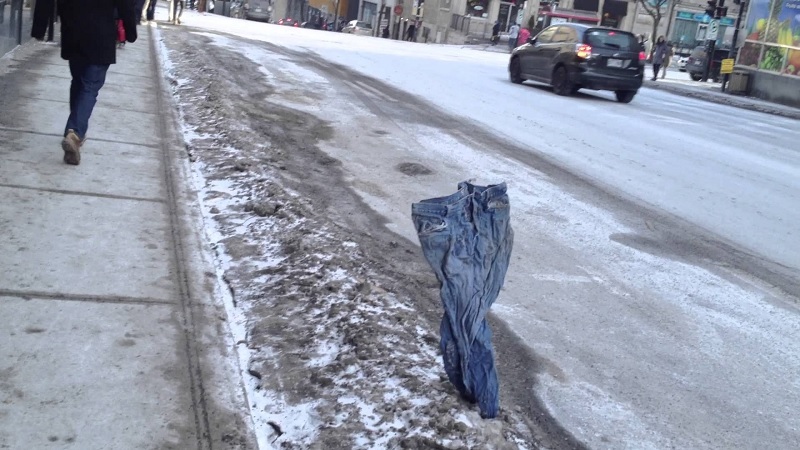 Sometimes, they peruse the horizon from roadside or lounge outside a neighborhood coffee shop, and sometimes he puts them in front of parking meters, where he can see people “awkwardly squeezing in between the frozen pants as they tried to fill the meter” near his work. Nothing lasts forever, sometimes not even a beloved nonprofit, program, or funding source. Instead of fading, though, Tyree Guyton and the Heidelberg Project are gunning for a comeback.